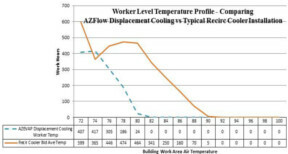 AZEVAP Inc. designs displacement evaporative cooling systems and manufactures the components needed to implement and realize the significant benefits of this cooling technique in industrial facilities. 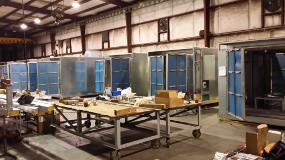 Namely, AZEVAP manufactures evaporative coolers, exhaust fans, long throw diffuser ducts, and an integrated building control system to optimize building worker level indoor air quality and energy management of the facility HVAC system. Air and water distribution in the cooler combine with controls to yield sustainable high cooling efficiency, no stagnant water or mold growth, and less scale build-up for extended media life with less bleed water. Integrated controls include features to automatically match cooling operation with internal and external environmental conditions for significant reduced energy consumption. Ideal for food processing facilities and other large commercial and industrial facilities, food processing, manufacturing facilities, warehouses, distribution centers, maintenance facilities, and airport hangars.